A guitar must be ‘in time’ with the music, particularly so with the fluid, changing rhythms of flamenco, but this is a punning title too. Only someone supremely skilled and confident in their own ability would present a set which summoned the ghosts and the music of masters past and then proceeded to play like them. 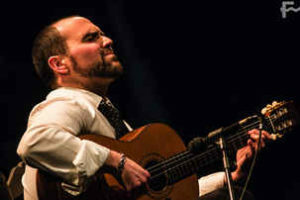 This is what Jerez-born guitarist Santiago Lara did on the middle Saturday of this year’s Festival de Jerez in his show La Guitara en el Tiempo. Beneath his habitual, and entirely genuine, modesty is an artist who knows his own mettle, as well as knowing the history of his art and metier, through and through. And with good humour too. Lara played alone in a single spotlight at first, an introduction to the world of the flamenco guitar. The audience, myself included, knew what we were going to get and this demonstrated it in spades – superb technical ability, worn lightly, with emotion and artistry of the highest order. There was immediate and tumultuous applause. 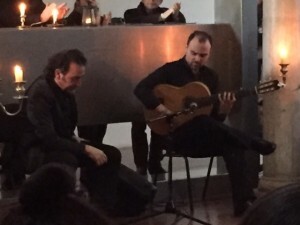 He was then joined by fellow musicians, Paco Leon on second guitar, Perico Novarro on percussion, with Fay Ramos and Javier Peña, palmistas (and one other, whose name I did not catch and who did not appear in the Diario’s review the following day). This is when the meaning of the title became apparent as film was projected on to the screen behind the players. First in scratchy black and white then in the fading coloured film stock of the 1960s and 70s, it showed the playing of great flamenco guitarists of the twentieth century, from Ramon Montoya, through Paco de Lucia to Manolo Sanlucar and, in some instances, what they said about each other and their antecedents. 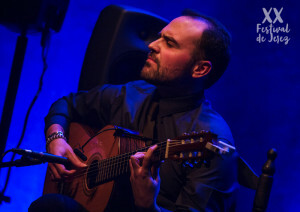 Lara’s set at the 2016 Festival – a tribute to the legendary jazz guitarist, Pat Methany (see Jazz Guitar) – showed us his interest in and admiration of the development of guitar music, not necessarily just within the flamenco tradition. Saturday’s set was his homage to those within that tradition, the one he is rooted in. But, like de Lucia before him, one he ventures out from to explore a wider musical world. So, we heard a wonderful homage/rendition of Entre Dos Aguas (de Lucia) in a section of the set devoted to his cross-over predecessor. Lara also gave a superb performance of Sanlucar compositions. 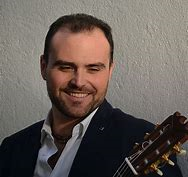 I first saw Lara six years ago when he was already a very accomplished Jerezano flamenco guitarist, with a fluid, instantly recognisable, style of playing. I saw him again in 2016 at the twentieth anniversary of the modern version of the Festival in a stunning combined performance with David Lagos and Mercedes Ruiz ( see Lamento ). He has matured into a remarkable artist, comfortable in the tradition from which he came, but taking flamenco guitar music to new places. He’s already attracting appreciative new fans from around the world, it was obvious from the audience’s reaction on Saturday that members of it already knew his work and many of them weren’t Spanish. There was a long and enthusiastic standing ovation at the end of the set. One of the places I’m hoping he might take flamenco guitar – in my humble opinion – ought to be Ronnie Scott’s in London ( or, come to that, the Festival Hall ). No serious music-lover who listens to Lara play could fail to be entranced and moved (and reduced to speechless admiration) where ever they come from and whatever their preferred type of music. But this was not the only time we saw him play at the Festival this year and I’ll be blogging about that event later. Santiago Lara (‘La guitarra en el tiempo’)-XXII Festival de Jerez from Festival de Jerez Televisión on Vimeo. Brilliant review Julie. He was magnificent and you’ve taken me right back to the concert. It was a privilege to there. And I wholeheartedly agree with you and hope to see him at Ronnie’s of the RFH.